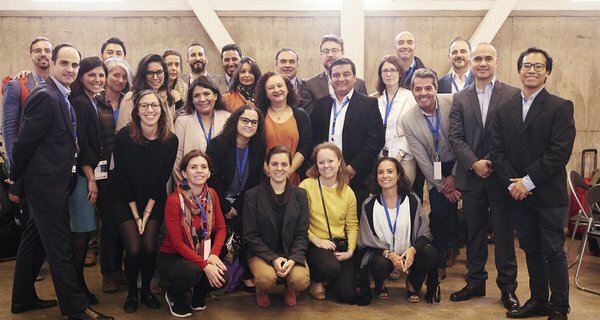 Nesta’s collaborative executive development programme for innovation policymakers, the Global Innovation Policy Accelerator, is reaching an exciting period: three cohorts in three different parts of the world, each at different stages of the programme. They are all working towards designing testable innovation policy solutions to challenges they face in their respective countries or regions: India, South East Asia, and more recently Brazil. It’s a unique opportunity to reflect on some of the choices we have made in terms of programme design, and what it has meant in practice for our participants. In this blog we outline three key programme design approaches with examples from our cohorts. What type of thinking is required in order to be successful when developing innovation policy? One could argue a spontaneous and free-flowing approach (divergent thinking) will result in fresh and innovative ideas. Conversely, a more grounded, analytical and deductive approach (convergent thinking) might be better. It is increasingly being shown that such an opposition is unhelpful and that the two needn’t be mutually exclusive. Indeed, policymakers need to be able to draw on different mindsets and approaches in order to be successful. The approach on The Global Innovation Policy Accelerator is iterative, based on the premise that the best ideas are produced as a result of embracing both divergent and convergent thinking, but in a conscious way. Switching between the two needs to be done methodically; trying to do both at the same time can result in bad ideas. 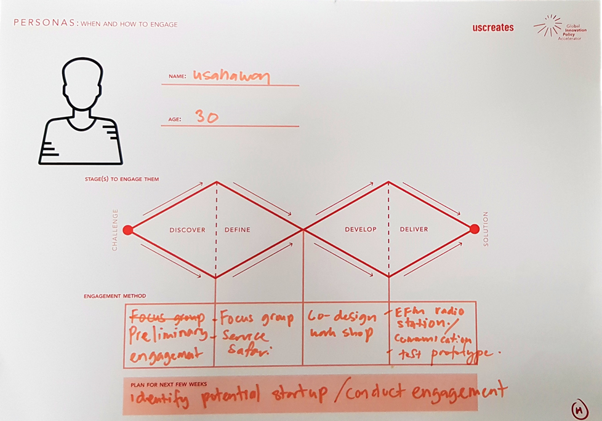 The ‘double diamond’ process - benchmarked internationally by the Design Council - sees participants repeatedly ‘opening up’ and exploring a wide range of possibilities for their work; followed by phases of ‘focusing in’ and narrowing down their ideas and making decisions. For the Global Innovation Policy Accelerator, forming new teams to tackle policy challenges meant we felt a third ‘diamond’ was required. We considered the journey of our participants on the programme and their needs; the triple diamond structure being the result of this. The first phase of the programme is called ‘Dialogue’. Participants explore ways of working best together in their country teams, and spend time gaining insights into policy challenges they might want to address; however, no firm decisions are made until enough exploration has taken place. During the subsequent ‘Diagnose’ phase they focus on firming up the policy challenge they want to address, and finalising team roles; all based on the insights from the previous phase. Although the wider programme is structured in this way, even individual tasks are carefully designed to maximise both divergent and convergent thinking. For example, earlier this year our India cohort met in teams to choose an innovation policy challenge to address in their respective departments. The process began in a divergent manner: they could come up with any challenges they thought were worthy of addressing in a silent ideation session. Soon, the facilitator asked them why it was worthy of addressing They would respond with more detail and reasoning. They were then asked why again... the reply developed further into something more elaborate and specific... why again. Five times in total. The idea being that by asking ‘why’ in a successive structured way narrows down the scope to help get to the root of a problem. 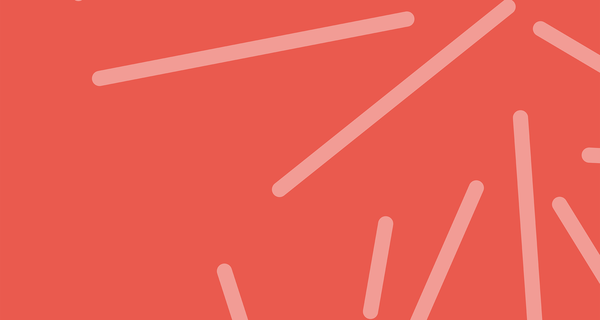 It’s simple, but pushing for The Five Whys of questioning uncovers assumptions, deeper motivations, and helps crystallise the problem you are seeking to address. A worked example from one of our workshops, using the 5 Whys to focus in on the heart of a challenge. 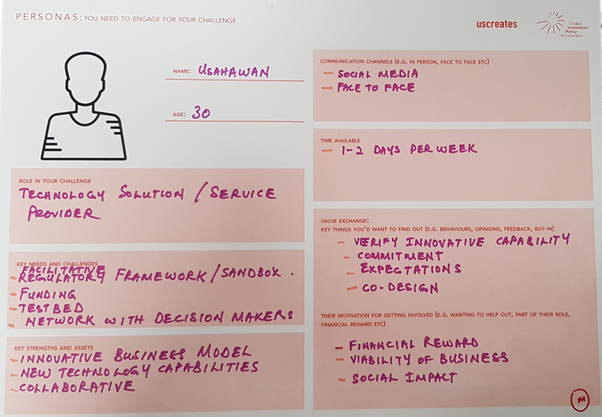 Meanwhile, our South East Asia participants - further along the triple diamond - are choosing testable solutions to address their respective policy challenge. Once again, they were iterating between divergent and convergent thinking in a structured, conscious way. Starting with a broad range of proposed solutions, these were promptly whittled down by applying three key criteria: was the solution pioneering? Was it practical? How about productive? Only those solutions that scored highly across all three became viable candidates worthy of pursuing, and converging on. 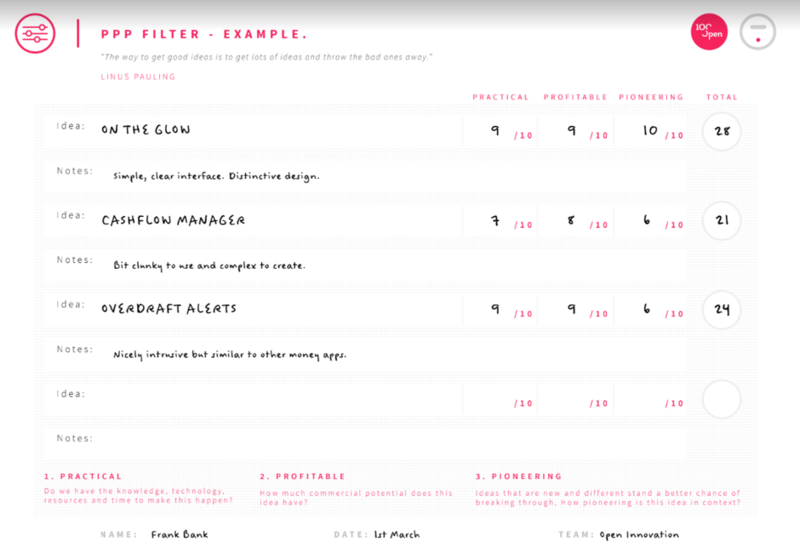 Our PPP filter was adapted from 100%Open’s, who we worked with to develop innovation tools tailored to the accelerator. Whilst consciously choosing to converge or diverge at the right time is useful, our participants have also been encouraged to put end-users at the heart of their approach. When developing a policy it can be tempting to think you understand who the end beneficiary is. Of course, it is essential to think about who they are; their attitudes, political leanings; socioeconomic status; what keeps them up at night? Generating such personas can help uncover unmet needs, but it is a largely hypothetical exercise based on assumptions we make about others. Policymakers often rely on intermediaries to understand who the beneficiaries are of their work, but this is of course different to actually talking to them. Indeed, human-centred design has been fairly slow to inform innovation policy making processes so far. On the accelerator we are supporting our teams to be more innovative in their policymaking, including adopting a human-centred approach. By immersing oneself in the stakeholder’s journey there are insights that can be gained that the policy cycle simply won’t provide. This is why after creating user journeys and personas, teams on the Policy Accelerator approach stakeholders they’ve identified. They test their assumptions and build on the personas and journeys they initially imagined, populating and refining them with insights gained from first hand interactions. Identifying where in the design process to approach stakeholders, in order to test the personas. Our teams then carry out the engagement activities at the respective stage. For example, our Philippines team are developing an online portal for researchers and grant providers in the agricultural sector. To inform their approach, they recently delivered a personas/storyboarding workshop. 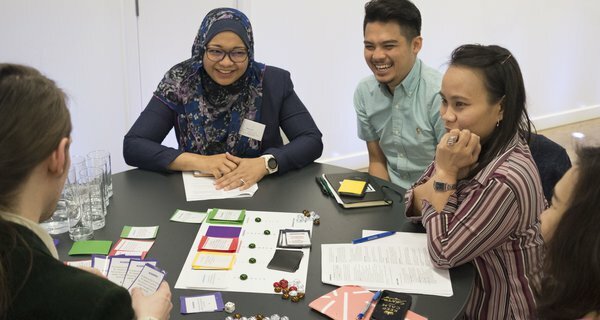 They invited over 20 representatives from research institutions and funding agencies, to test whether the personas and journeys they created were accurate reflections of potential users. Key feedback included adding private sector personas and technology transfer officers. Whether it’s stakeholder interviews, surveys, or shadowing; teams choose approaches that are compatible with their political systems and structures. We’ve seen a movement towards this user-centred approach in government through initiatives such as Policy Lab. Collecting the most useful insights also requires strategic questioning. For example, our participants use laddered questioning; where you start with broad, open questions and then methodically increase the specificity in a bid to get to the heart of an issue. We find such an approach - which chimes with the double-diamond approach - often results in the most honest and useful answers. None of these approaches can be successful unless our teams are aware of their respective relative strengths during their public problem solving work. For this reason we place a major focus on nurturing the skills and attitudes necessary for successful public problem solving. 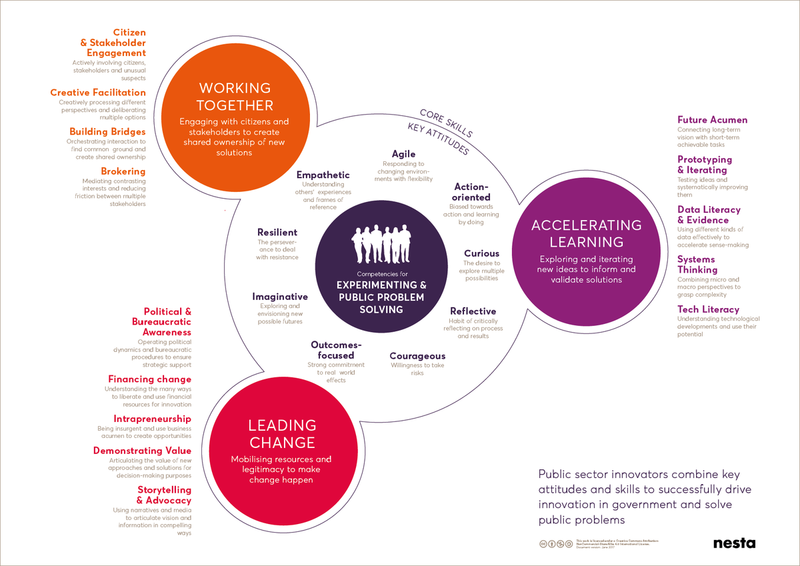 Nesta - in collaboration with governments and other organisation - has defined the key skills, attitudes and behaviours that are necessary to successfully solve public problems. This has been done through a competency framework aimed at public sector innovators specifically. There are many ways such a framework can be used; to develop HR policy; for evaluation purposes; defining team roles; and much more. One key way we’ve used it to is to better define programme objectives and the activities to achieve these. We want to ensure the programme presents an opportunity to develop the skills and attitudes defined by the framework. For example, ‘Prototyping and Iterating’ is one of the key skills, which is why teams work towards testing a policy idea at the end of the programme. Policymakers also need to be able to articulate why their problem matters, and demonstrate the value of their solution; which is why there are are sessions focused on compelling storytelling. Defining our learning objectives around these also means we can easier evaluate the progress of teams; match them more effectively to mentors depending on areas they need support in; and to support them in effectively defining team roles through regular team coaching support. As a team we are also embracing these approaches internally. Iterating continuously, shaping our programme to our participants’ needs, and evaluating our own skills and attitudes ensures we can effectively support our participants. As the programme expands into Brazil and potentially other regions we look forward to sharing further insights. Great article; very thought provoking and helping I think in encouraging new and creative solutions to be explored and developed... its great to have some frameworks like this to help to reframe things. Desing think emerged from a consciousness level of Orange in Prof Graves biopsychosocial systems materialistic, result-driven. Essentially, Orange is not good or bad. Orange exists. And we distinguish healthy and unhealthy manifestations of Orange. What are healthy manifestations of Orange? Result-driven, explorative, be able to think strategically, switch pragmatically to solve problems, entrepreneurial. What are unhealthy manifestations of Orange? Calculating, opportunistic, exploitation of the living environment, manipulative and abusing nature and environment, not taking one’s responsibility, too functional, too busy and loosing sight of the human aspect. We can solve today's problems with the same level of think that created them. If we start to think from a Yellow leave Core Values: Systemic, integral, emergent Essentially, Yellow is not good or bad. Yellow exists. And we distinguish healthy and unhealthy manifestations of Yellow. What are healthy manifestations of Yellow? Critical, curious without judging and keep asking questions. Can easily distinguish between the essential and the ancillary. Creative and innovative and has a continuous flow of new ideas and ways of thinking. Uses the most appropriate and workable methods and behaviors to realize strategies and builds on already existing knowledge and models. What are unhealthy manifestations of Yellow? Get bogged down in complex analysis. Builds castles in the air; inventing beautiful futuristic solutions, which are not pragmatic. Not able to finish something because there’s always something new that requires attention. Everything is criticized and made more complex instead of doing what actually needs to be done. At times, Yellow may seem cold and distant as it sometimes forgets to connect to people (because of its enthusiasm). I have been involved in two innovations in my career. 1. A friend and I "invented" the worlds first interactive PC/Video disc system. It was for a picture library that wanted to do fast searching of its picture bank to get the pictures that its customers needed. It used the early Phillips video disc system and whilst it worked well the cost of transferring about 2,000,000 pictures onto the video disc was so high that the system was uneconomical and never put into service. 2. I "invented" the first aircraft performance computer for use on the flight deck of an airliner to calculate the take-off and landing parameters required by the aviation regulators. This system initially use the Psion hand held computer and allowed pilots to do a rapid re-calculation of the take-off and landing performance in the event of a sudden change in runway conditions or weather. My company then sold a lot of these mainly to corporate jet operators. What was common to both these innovations was that they arose from a problem that people did not have a satisfactory solution to. In the case of the picture library it was the amount of time and cost of meeting the customers requirements for pictures. In the case of the take-off and landing performance the paper system approved by the regulators was very cumbersome to use and error prone. There had been a number of serious accidents due to pilots getting the calculations wrong. Innovation starts with someone seeing a problem. The best way to explain this is "Tinklers Dammit Principle", "Dammit there must be a better way to do this". The key point here is that although you "know" that there is a better way you don't know what it is. The only thing that you can do at this stage is start playing with ideas, sketching things out on the back of a fag packet, bouncing ideas about and trying ideas out all the time looking for that key something that will provide the solution you are looking for. An example of this was I had a young lady working for me who had to give a 5 minute talk to a customer. She had tried everything and could not get to the 5 minute target. It suddenly dawned on me that if she timed herself walking up and down between two lamp posts in the street and see where she got to in 5 minutes that she could practice her speech and adjust so that she came to the of it at the 5 minute point. Worked like a charm, the neighbours were bemused by the young lady walking up and down the street muttering to herself, but the result was a brilliant speech. The point here is that the solution you are looking for is often way outside the logical solution space. James Dyson's "solution" to the problem of vacuum cleaners losing suction was inspired by seeing the cyclones clearing dust from a sawmill. This initial serendipity stage only gives a pointer towards a possible solution and not the solution required to solve the problem. Now comes the hard bit, "Making it work". About the only guarantee you have when you start this phase is that the first attempts will not give a solution. James Dyson built over 4,000 prototypes before he got his cyclones to work in a way that he could start making a saleable vacuum cleaner. The second key point is that this is the time to move from a solo effort to a team effort. You will need to involve a wide range of people, mathematicians, materials experts, aerodynamicists et al to gain insights into how to make the ideas you are trying work in practice. The team may be formal or informal but you need it as you go through the trial and error process, no one person has all the knowledge of skills to come up with the solution to a complex problem. All the great innovations have come from a small group of people doing "trial and error", Jobs and Wozniak, Hewlett and Packard, Wilbur and Orville Wright, James Dyson. If you want to see how innovation works and can change the world read "How We Invented The Airplane" by Wilbur and Orville Wright. This should be a must read for all budding innovators. So, you have had your inspiration, done your trial and error and now you are launching your product, system to an unsuspecting world. The first thing that will happen is that they will break it. The second thing that will happen is that the Bank, Venture Capitalist or Business Angel will PANIC. As the military says "No war plan survives the first encounter with the enemy". There is only one thing you can do, fix it to the satisfaction of the customer. You must treat the introduction of something new as simply an extension of the trial and error phase. Rule Number One, users will always find new and innovative ways of breaking your product or system. The tragedy we face is that schools are now dedicated to teaching things that are right and can be regurgitated to pass exams. Students are not allowed to get things wrong and team working is cheating. This is the very opposite of the skills we need to develop if we are to become a more innovative society. A collaborative development programme for innovation policy leaders and managers. What we learned about collaboration for innovation running the Global Innovation Policy Accelerator.